Plastic Jesus, the Los Angeles-based street artist behind the "Future Internment Camp" signs and other cool stunts, is back with a new piece. 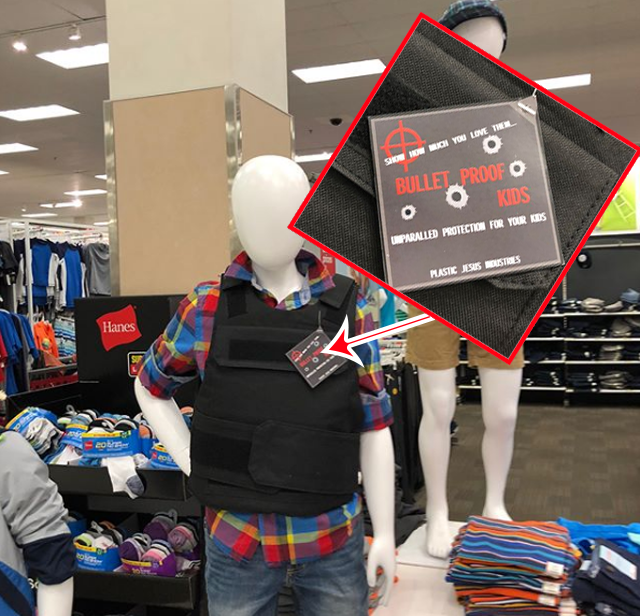 For his latest work, he's droplifted specially-tagged bulletproof vests in the kids' back-to-school section of three Target stores and one Macy’s in Los Angeles. “Back to school” get everything you need for the new year. Including ‘Bullet Proof Kids™️- Level 3A bullet proof vests. By Plastic Jesus industries . This one at Target . Los Angeles. “Show your child how much you care... Don’t let your child be the next victim... money back guarantee... endorsed by the NRA” Coming to a store near you. We’re finding so many excuses to validate these shooters. Things like video games or bad families are being used to excuse their actions. Seeing shootings so normalized is abhorrent."